Vacation is meant to be fun and relaxing. With no office to go into and no stove to slave over, you can enjoy some peace and quiet and forget about life for a while. Unfortunately, many Americans return home to a rude awakening in the form of a big, fat vacation bill. 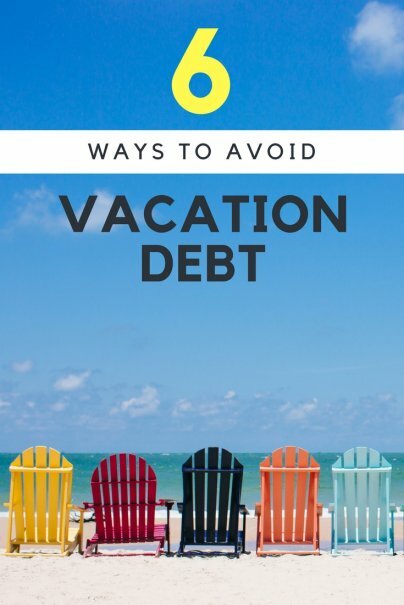 Nearly three-quarters of Americans have gone into debt to pay for a vacation, racking up an average balance of $1,108, according to LearnVest's 2017 Money Habits and Confessions Survey. One possible reason Americans wind up with vacation debt could be the fact that more than half of us don't have a travel budget. The LearnVest survey shows that 55 percent of Americans don't factor vacations into their annual spending plans. For example, if you cash in frequent flyer miles to pay for your airfare, you can focus on saving for your hotels and food separately. Or, consider driving to a hotel you paid for with points. In that case, you would only be on the hook for travel expenses, activities, and food. Of course, travel rewards are not a good option for people struggling with debt. The key to using credit card rewards for travel is to never carry a balance. Instead, consider your cards as a thoughtful extension of a planned out monthly budget. 5. Cut your expenses, or try a "spending freeze"
The LearnVest survey found that the most common ways Americans save money for travel are avoiding restaurants, shopping less often, and spending less on entertainment. This is all good news, as "extra" spending categories like dining out and entertainment are often the easiest to cut. But, that doesn't mean you can't look for more ways to save money over time. As you save up for a vacation, you can even try a spending "freeze" — an exercise in which you only spend money on absolute essentials for several weeks or months. If you can avoid extra spending for short bursts of time, you can reach your vacation budget goal much quicker. Not everyone has enough wiggle room in their budget to cut out enough to pay for a vacation. Maybe you live in a high-cost area, or perhaps your monthly expenses are unusually high due to debt, child support, or other factors. Either way, it's hard to save for vacation when you're barely making ends meet. Your side hustle can be anything, although you'll probably earn more if you align it with your career or some skill you already have. If not, you can always try something like baby-sitting, dog-sitting, or housesitting. Mow lawns, drive for Uber, or tutor kids online. Start hustling, and by the time your next vacation rolls around, you'll be ready.